Spanish Prime Minister Jose Luis Rodriguez Zapatero holds a trophy as he poses with member of Spain's basketball team at Moncloa palace in Madrid, Sept 19, 2011. MADRID - The Spanish Basketball team celebrated winning the European Championship by parading the trophy through the streets of Madrid on Monday before offering it to thousands of delighted fans in the middle of the capital. Spain defeated France 98-85 in the Lituanian capital of Kaunas on Sunday to win the trophy and end an impressive tournament in which they were defeated only once. The Spanish side, which is coached by Sergio Scariolo, holds players such as Marc Gasol, Ricky Rubio, Rudy Fernandez and Jose Calderon who all ply their trade in the NBA. Spain's star player Pau Gasol is currently with the LA Lakers, but it was Juan Carlos Navarro who was the hero in Kaunas. The guard scored 27 points in the final and was voted MVP of the competition. The Spanish team carried the trophy in an open topped bus, down the central, Avenida de la Castellana and along the Gran Via, where thousands of fans were waiting. 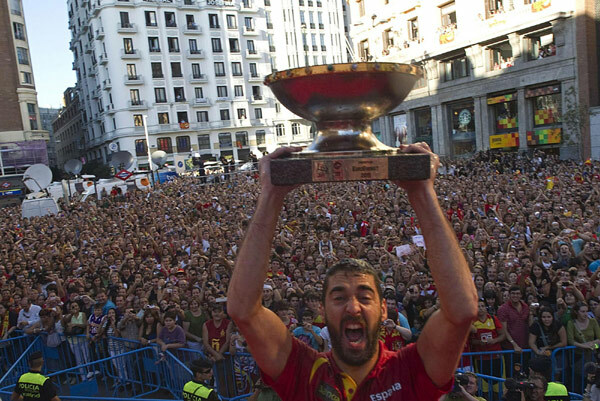 Spain's national basketball team captain Juan Carlos Navarro raises the FIBA EuroBasket 2011 trophy during a celebration ceremony in central Madrid, Sept 19, 2011. The players took turns to lift the trophy into the Madrid sky and all of them had words to saw, while the fans wasted no time in showing their appreciation. The team spent over half an Callao before making their way onto the bus and while many supporters decided to continue their celebrations. The team is now thinking ahead to their next big task - the 2012 Olympic Games, where they hope to improve on the silver medal they won in Beijing. Spain's national basketball team player Pau Gasol gives the thumbs up while holding his gold medal during a celebration ceremony in central Madrid, Sept 19, 2011. 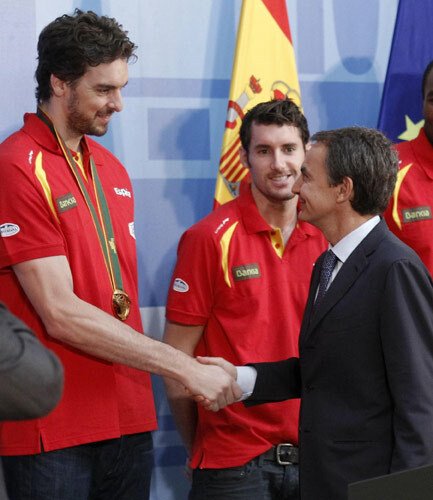 Spanish Prime Minister Jose Luis Rodriguez Zapatero (R) shakes hands with Spain's basketball team member Pau Gasol at Moncloa palace in Madrid, Sept 19, 2011. It’s really a great and useful piece of info. I am glad that you shared this useful information with us. You need to participate in a contest for top-of-the-line blogs on the web. great submit, very informative. I wonder why the opposite experts of this sector don't realize this. provide something back and help others such as you aided me. individuals on this topic, however you sound like you already know what you’re speaking about! can't wait to read far more from you. This is really a terrific website. certainly be one of the very best in its field. Fantastic blog! community with many lovely professionals with very helpful tips. whoah this blog is fantastic i love reading your articles. Stay up the great paintings! Wordpress or go for a paid option? There are so many choices out there that I'm totally confused .. Any ideas? Many thanks! internet-site.I needed to thanks for your time for this glorious read! this web site is something that's wanted on the internet, someone with just a little originality. helpful job for bringing something new to the internet!